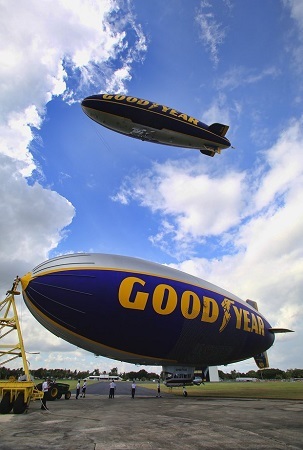 Source: Goodyear Tire & Rubber Co.
For the first time ever, two Goodyear blimps will simultaneously provide live aerial television coverage of a sporting event as they circle overhead Miami’s SunLife stadium for ESPN’s coverage, beginning at 7 p.m. ET, of the November 9 NCAA football matchup between Virginia Tech and Miami. 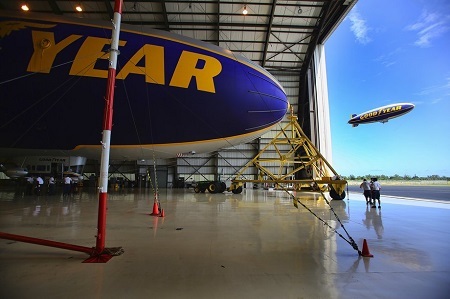 The Spirit of Innovation is on the ground still in the hangar as The Spirit of Goodyear flies overhead. 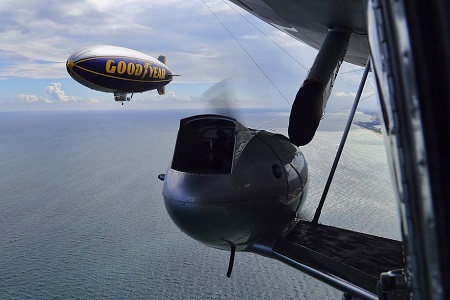 Looking out the windows of The Spirit of Innovation, The Spirit of Goodyear flies over Pompano Beach. 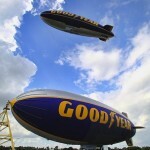 This entry was posted in Blimps, News and tagged Aerial TV coverage, blimp, goodyear. Bookmark the permalink.